SECURITY BREACH? GOING TO BE A LATE ONE. Fluid IT handles the entire managed security landscape by providing a comprehensive layered approach to security for your entire organization. We have the certified security engineers, deep expertise, and leading-edge equipment to deploy your complete cyber security strategy…on site, on time, and on budget. Plus, Fluid IT provides all the necessary hardware, software, and ongoing management to ensure your security system stays a step ahead of potential threats. At Fluid IT, we support our clients in four primary areas that your business must address to have a comprehensive security plan. Does your firm understand all levels of compliance required given the data your company stores and businesses it interacts with? This can range from data compliance requirements, like encryption, to data-center configuration standards. Great compliance management starts with required policies and procedures, combined with staff training and monthly monitoring and reporting to ensure and validate compliance. Once you know your weaknesses, you need to have a disciplined approach to mitigate risks, including monitoring for attacks and having an active response plan if/when attacks are detected. Much of this can be automated, but some expert oversight can make sure you don’t have any unintended gaps. Think of your IT perimeter like the physical perimeter of a secure building. Are all entries and exits secured and guarded? Firewalls, cloud services, and email are major vulnerability points that should be managed and monitored for security purposes. BYOD and the proliferation of mobile and IoT devices have extended this perimeter, but these potential problems have solutions if they are approached systematically. Even the best-run IT Departments may run into an occasional problem, ranging from accidental data loss to a malicious breach. We’ve found from our experience that having a robust backup in a secure cloud environment can minimize the impact of nearly any problem. Cybersecurity is a very common blind spot for businesses, overly complex and almost impossible to understand. Unfortunately, it also carries some of the highest business risk and uncertainty because not addressing it can literally take a business of any size down. What if you could shed some light on cybersecurity and have just enough understanding to mitigate the risk and remove the uncertainty to sleep better at night. Our security reports show the kind of detailed information Fluid can provide to see what is happening and do something about it! Click here to see a sample. Don’t wait for the next security breach to sideline your firm. 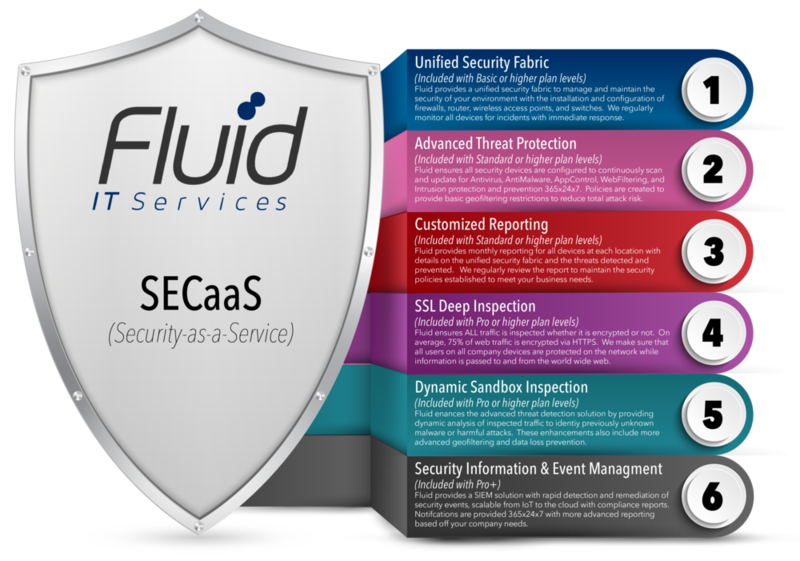 Fluid IT today at 877-562-1666 or email us at Secure@fluiditservices.com.